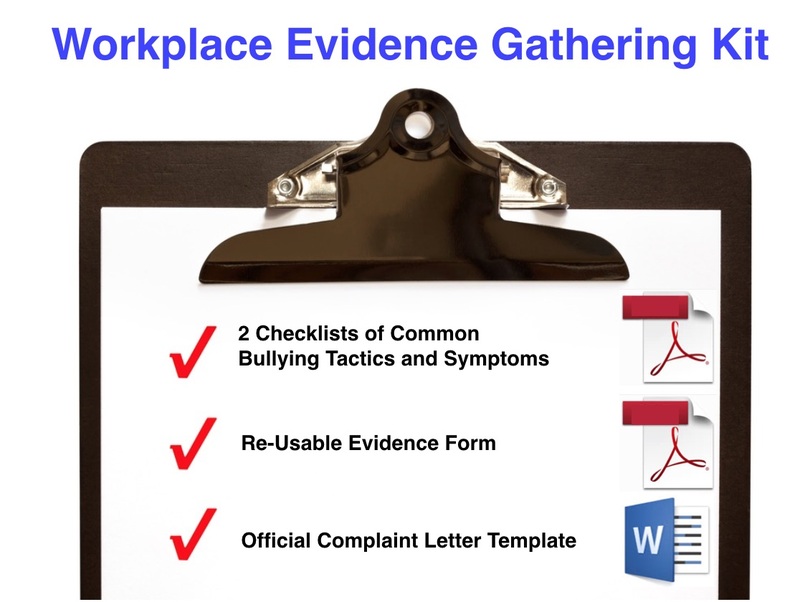 In this article, I’m going to discuss how to structure a complaint to HR using the Workplace Evidence Gathering Kit. This is an area that most complainants make predictable but avoidable mistakes. Most companies are in business to make a profit. The role of HR within that business is to ensure compliance with various laws so as to avoid expensive litigation. They also hold employees accountable for doing their jobs to make the company thrive. 1) They don’t know what the hell to do with it. Most HR professionals aren’t trained in how to deal with the complex emotional dynamics involved in bullying. They don’t prioritise restorative justice and emotional recovery. 2) This is a threat to the company because they could be up for expensive litigation when inevitably, negotiations go south. Well, now you’ve made this complaint, YOU have become a threat to the company. Their thinking is more likely to be along the lines of “how can we make this problem (i.e., YOU) go away?” – In the most expedient way possible. Hence, companies who claim a “zero tolerance” to bullying, more often than not have come up with “crafty” ways of denying it – to cover your arse (CYA). They say: “we did an investigation (read: “sham investigation by unqualified employees who don’t know what the hell they’re doing). “We’re not able to prove the allegations. Our finding is that you have a personality clash” with this person. Then they suggest mediation, which doesn’t work according to extensive research in this area. Gary Namie, the world’s foremost authority on workplace bullying, consistently demonstrates this in his results from surveys. Then, what often happens is they turn their attention to performance-managing you out of the company. Now you’re labelled as a “troublemaker” and it’s time for you to leave ASAP. Instead, I invite you to take some perspective. Before you send in that letter of complaint, imagine how it will be received by your reader. What is it that motivates them? How will that colour their perception of your complaint? As such you need to consider writing your letter in a way that targets the self-interestof your reader. For that, you need to have exceptional workplace evidence gathering skills. And, bearing in mind that once you enter the fray of putting in a complaint, thereafter will ensue an adversarial process. Meaning – the onus is on you to PROVE your case and often you’ll be badgered into acquiescence. What this means is a lot of extra work, so factor this in when you decide on the OUTCOME you want. You need to be methodical and consistent in documenting your evidence. Keep it in a safe place until such time as you’re ready to use it. One checklist consists of 30 typical bullying behaviours in order of frequency of occurrence. The second checklist consists of 30 of the most common symptoms of being bullied. Both these checklists are drawn from the work of Gary Namie. The form prompts you to describe, in the most succinct way, the bare facts of the bullying. From these checklists, you’ll also be able to enter a number corresponding to the type of behaviour and its impact on you. Record each bullying incident in the form in a way that eliminates “emotional hooks.” In other words, don’t drown your reader in emotionally overwhelming language, using weighty adjectives. If you do that, they’ll switch off and won’t read beyond the first couple of lines. To receive such a letter can be very intimidating and often has the power of a “cease and desist” letter by a lawyer. Can you imagine how terrified YOU would be to get such a letter? It goes without saying that following this course of action takes a lot of your time and attention. You could take 2 weeks or more to draft it. You might also break workplace relationships beyond repair. So you’d better be ready to walk out WITH a sound back-up plan. If you’re not prepared to take this much disciplined (but highly effective) action, then one option is to leave without saying anything. You could tolerate the unacceptable behaviour, but your mental health will suffer. Both those options are valid choices, but they’re passive and won’t give you the sense of achieving adequate restorative justice. If you do take the more difficult, but more rewarding route, you’ll probably be beset by anxiety and uncertainty in the short term. But in the longer term, the knowledge that you’ve stuck up for yourself will immeasurably boost your self-confidence and trust in yourself.